Who knew that the bug blasting Earth Defense Force series stretched back as far as the SNES? I kid, I kid. 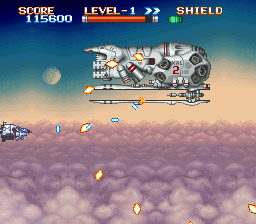 Super Earth Defense Force was part of an onslaught of arcade ports that arrived shortly after the SNES launch. There were quite a few shooters in that early lineup, most of them bad but Super EDF happens to be a decent with a few unique features under its belt. While it doesn’t challenge the likes of Axelay and Gradius III it sure as hell beat the pants of pap like D-Force. Alien invaders have taken control of the dark side of the moon and begun their attack on Earth. Through their attacks it is discovered that the aliens have a super weapon capable of wiping out life on Earth. The Earth Defense Force is called on to send their advanced XA-1 fighters in a preemptive strike before Earth ceases to exist as we know it. While I never played Super EDF in the arcade much like U.N. Squadron it finds a perfect home on the SNES. Since the game isn’t focused on twitch action and high speed rushes to the end of each level the SNES’s slower processor is not a hindrance. While certain aspects of the game could be better overall this is a solid shmup on a console not known for such. Earth Defense Force’s main hook would be its massive weapons cache. At the beginning of every level you have a choice of 8 (4 more than the arcade) weapons. The weapons cover a wide spectrum of shooter staples, from the typical thin but powerful laser to a homing shot. However there are a few that stand out. The Explode shot does exactly what the name implies, makes your bullets explode in 4 directions on impact. Atomic is similar but creates a damaging cloud that expands when more enemies collide with it. Grenade…is a trap. The weapon is so terrible I think the developers included it as a gag. All weapons are graded on 3 factors, shot speed, shot power, and rapid shot. These static ratings mean nothing in the long run since you gain experience and level up 5 times with more kills and can increase their power exponentially. Some like the S. Laser and Photon become absolute beasts at higher levels while the standard Vulcan never seems effective. Further boosting offense are the two satellites that are paired with your ship. These satellites function like the Force in R-Type. The 4 formations available will alter the attack pattern and power of your weapons, meaning you’ll have to learn their characteristics for survival. As a bonus they are invincible and can inflict damage too. Despite only topping out at 6 levels EDF feels twice that length because of how long each level spans. There’s rarely a dull moment as the screen is constantly filled with enemies. There’s very little in the way of environmental hazards placing the focus squarely on how well you can dodge bullets. The overall challenge is largely determined by the weapon you’ve selected; if you’ve chosen a weapon that is ill suited for the types of enemies you’re facing basically you’re screwed. Some of the basic enemies and especially the bosses are massive bullet sponges, riding out with a slower weapon like the Photon shot is basically suicide in that case. That type of bad choice is a real possibility since you aren’t briefed on the terrain or enemy types beforehand it’s either make the most of a bad situation or reset. Death is handled differently this time out so at least the game is completely working against you. You have 3 shields that function like a life bar. With each hit a shield is lost but the game continues. Lose all 3 and you’ll have to continue which does send you back to the beginning of the level. If you’re good enough you can not only replenish shields but build up a stock although the game won’t show it. The presentation of EDF has its moments but overall is a bit tepid. There are no wild special effects thrown around but the game has solid art on its side as well as a vivid color palette. The multi-scrolling clouds of the first level transition from day to night subtly. Mode 7 is used in many subtle but effective ways that most of the early SNES games could have benefited from. In particular halfway through level five a giant planet slowly zooms in from the distant background until it obscures the rest of the surroundings. The bosses while large look as though they could have been ripped straight from a Darius game, which isn’t a slight but is unoriginal. There you have it. Super EDF doesn’t try to knock your socks off with new technology but entertains with its solid gameplay. At the end of the day that’s what its all about.